Ornamental plants are used in landscapes for showy foliage and other interesting characteristics including flowers or fruit. Use them as edging, borders and as garden centerpieces or points of interest. Many varieties of trees, flowers and shrubs make good ornamental plants. Glossy abelia, an evergreen shrub, grows best in full sun and is popular in mass plantings and hedges. Depending on the cultivar, some plants are compact, reaching only 3 feet in height. Other cultivars are larger, reaching 4 feet in height and up to 5 feet in width. The foliage also differs depending on the cultivar, with some being green or variegated, and others being white, yellow and pink. One variety produces white flowers all throughout the growing season until the killing frost. Winter weather may cause the stems to die down, but the plant will usually come back the next spring. According to Michigan State University, this ornamental plant is hardy in zones 6 to 9. Common yarrow is an herbaceous perennial that is commonly used as a border, field or meadow plant. The dense, fern-like foliage produces numerous flowers ranging in color from red to pink and white. It may produce a second round of blooms if deadheaded. The foliage is scented when bruised. 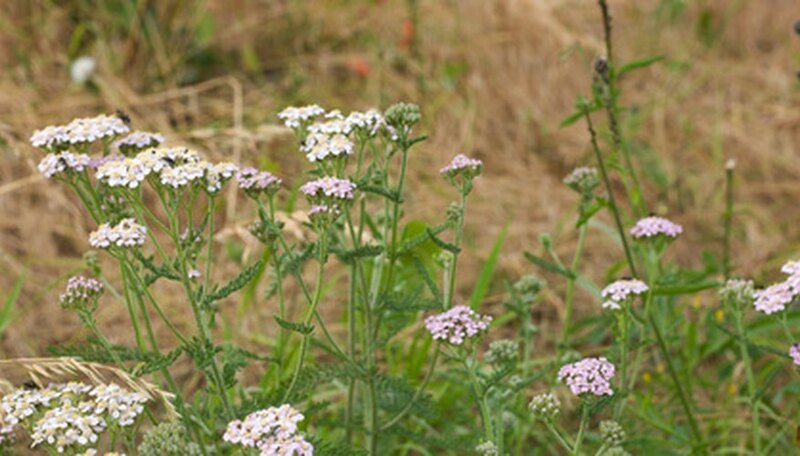 Common yarrow can reach 1 to 3 feet tall and equally as wide and may sprawl or form a clump. A member of the daisy family, this ornamental plant grows best in full sun and moist, well-drained soil. However, common yarrow is significant for its tolerance of less than desirable conditions including dry, rocky or compacted soils. According to Ohio State University, this plant makes an excellent cut flower. Common yarrow is hardy in zones 4 to 8. Variegated bishop's goutweed is a deciduous groundcover commonly used as a border, edging or foundation plant. It may reach 8 to 10 inches tall and forms a dense mat of variegated foliage. It tolerates a wide variety of environmental conditions including poor soil but grows best when planted in consistently moist soil in a partially shady area. According to Ohio State University, variegated bishop’s goutweed can become somewhat invasive and should be planted in a location of restricted growth.